Which Intravenous fluid to use in diabetic ketoacidosis? This case was chosen as DKA it is a common critical care scenario and has several interesting learning points due to common misconceptions about its management. A female 20-year-old type 1 diabetic was admitted having been found collapsed at home by her housemate. She was hypothermic, hypotensive, semi-conscious and acidotic. In A&E she was fluid resuscitated, warmed with a forced air warmer and treated as per the hospital guidelines for diabetic ketoacidosis. Her blood pressure normalized with fluid resuscitation. The ICU team were asked to review the patient. As there were no critical care beds available the patient was kept in A&E and regularly reviewed by the medical and intensive care teams. Eight hours after admission she remained severely acidotic despite the fluid resuscitation and insulin therapy she had received. The intravenous fluid was changed to Hartmanns and insulin continued at a low rate to bring her blood sugar down slowly. It was documented that she was to receive no more 0.9% saline, and to receive Compound Sodium Lactate (CSL) instead, despite the hospital guidelines (which specify 0.9% saline). From this point on her acidosis resolved more rapidly and by the following morning was well enough to go to a medical ward. Being strong anions they lower plasma strong ion difference (SID) 2 and cause a metabolic acidosis. 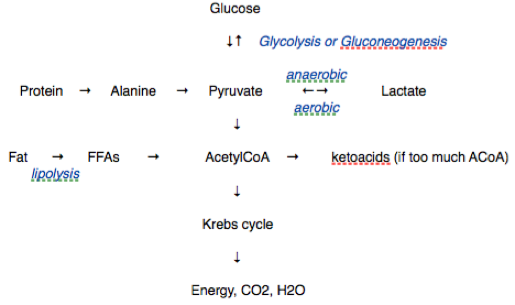 The acidosis can also be exacerbated by the severe dehydration, which accompanies ketoacidosis, from the osmotic diuresis due to hyperglycaemia. This hypovolaemia results in the accumulation of renal failure anions (chloride, sulphate, urate etc) and weak acids (phosphate) and increased production of lactate. Treatment with insulin (which lowers glucose levels and therefore ketone production) and fluid resuscitation is therefore nearly always effective in treating diabetic ketoacidosis. It is traditional for this condition to be treated with 0.9% saline (with potassium added as indicated). Presumably this is multifactorial - 0.9% saline has traditionally been the most available isotonic crystalloid for resuscitation and it is easy to add potassium to it. There is also the common misconception that CSL increases glucose levels via lactate metabolism and that infused lactate may worsen the metabolic acidosis. The blood pH that results from crystalloid resuscitation has nothing to do with the pH of the solution nor its titratable acidity. Instead, the effect is completely explained by the SID of the infusate. 4 Under most circumstances the lactate in CSL will be metabolized as rapidly as it is infused since normal lactate clearance can reach 200mmol/hr. Therefore the BE will be lowered by 2.5mEq/l for each L of 0.9% saline in this theoretical model. It is well recognised now that 0.9% saline causes hyperchloraemic acidosis. 5 The kidneys will eventually compensate for this by excreting the excess chloride but this takes time. (If the saline treats hypovolaemia then BE will of course rise by restoration of renal excretion of strong anions and reduced lactate production). It is to be acknowledged that because pH is a logarithmic scale an acidosis will by definition improve exponentially which will partly explain the initial seemingly slow improvement in this patients pH. However this does not change the fact that an acidosis will resolve more quickly with CSL than with saline. Another complicating factor in this case is the hypothermia. pH is temperature dependent with pure water having a pH of 7.5 at 0 degrees C and 6.1 at 100 degrees. This patients pH would therefore have been lowered by being warmed. Applying the alpha stat principle would mean looking at non temperature corrected ABG results (ie at 37 degrees). 6 This makes more physiological sense as it is probably acid-base neutrality (H ions equalling OH ions) rather than pH per se that is important for physiological homeostasis. It seems clear that CSL should be the treatment of choice for diabetic ketoacidosis. The acidosis will resolve more quickly and the plasma glucose level will be unaffected. This will be my treatment of choice in future and I will try to get the hospital guidelines changed or different guidelines written for the ICU. If hypothermia is present alpha stat rather than pH stat should be applied.